Cancun is in Mexico, but is there any Mexico left in Cancun? To be honest, it can take some searching to get beyond the tourist traps and U.S.-dollar-based economy, and it can be a little demoralizing for those who hoped that a trip to Mexico would give them more than just cheap Coronas and beaches full of American partyers. If you can escape the pull of the colorful tourist markets and the lure of overindulging in “free” alcoholic refreshments at your all-inclusive resort, then head into the town Centro and find the oasis of El Parque de las Palapas. 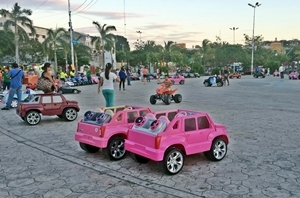 Of an evening the park comes alive as a meeting place for local families; it is a world away from the “Mexicoland” theme park that is Cancun. The joyous laughter of children rings out over the lively music pumped through the scattered loudspeakers as they drive around in one of the kid-sized electric cars or have photos taken with costumed superheroes and cartoon characters while the parents congregate around the numerous and delicious food stalls selling all of the genuine street foods one hopes to find in Mexico or browse the wares of local artists and craftsmen. The wonderful aromas entice you to pull out your wallet and try everything on offer, which is something you can easily afford at such cheap prices… and you can pay in pesos! You must try a Marquesita, with several stalls selling this crispy delight filled with your choice of savory or sweet ingredients. Nutella and banana makes a mouthwatering combination. It is easy to think yourself in a much less tourist-obsessed part of this amazing country as you get caught up in the sounds, smells, color, and family atmosphere this park offers. So if you find yourself in Cancun wondering if you are really in Mexico, spend a few hours and a few pesos at El Parque de las Palapas and live like a local. At least until that resort calls you back to the beach.